Drunk lady looks like a dude? A new ad campaign attempts to stem female binge-drinking. Recently, there was a report that alcohol abuse had increased substantially among women. Yea, girls, we're doing our part to close the gender gap! Now, I'm a girl who likes to throw back a pint or five, but I'm also aware that chronic drinking (never exactly recommended by doctors) can have particularly gnarly effects on women's health, due to the fact that we metabolize booze differently than men, and you have to keep those long nights at the dive bar in check. So how to encourage us to put down the Stella Artois and step away from the bar? 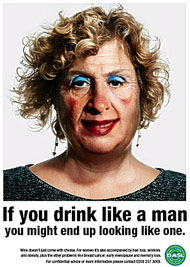 A recent ad campaign from the Drug and Alcohol Service for London has decided that, rather than droning on about these health concerns, they should aim straight for women's vanity: "If you drink like a man you might end up looking like one," a new subway poster reads. (Presumably, someone nixed the ever-catchy, "If you drink like a man you might end up peeing like one.") According to this report, research "revealed that two out of five women are worried about the physical impact of drink and only a third about health risks." (That's reminiscent of a recent Reuters headline that announced, "Women worry more about weight than cancer.") Part of the reason for this imbalance is that we're a looks-oriented society in which gaining five pounds is treated in some circles like a Shakespearean tragedy. It's also because when it comes to issues like health and safety, drinkers of both genders have always felt a bit too indestructible.